Not all targets are created equally. Pick the right target for what you are trying to accomplish. 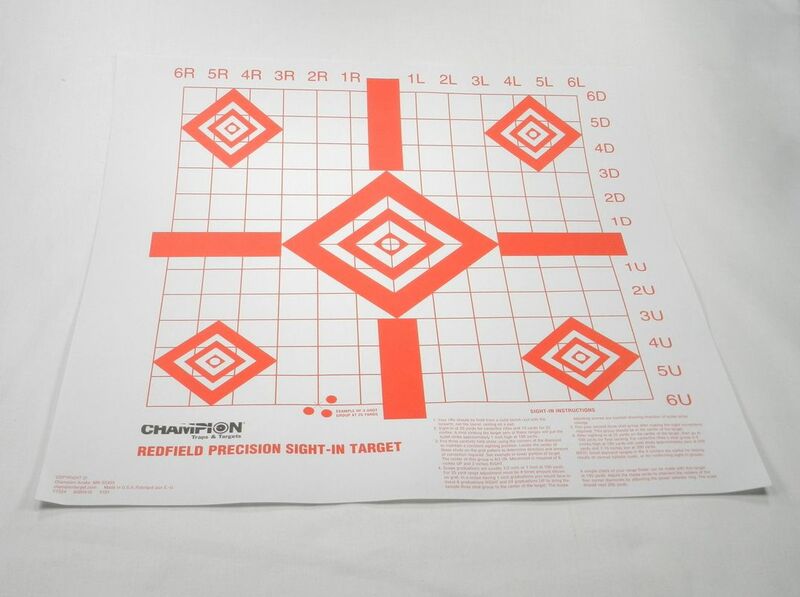 Champion Traps & Targets Redfield Precision Sight-in Target - 16" x 16"
The first time you shoot a new firearm (or add a scope or new sights) you need to zero-in the gun. To do this you need the right target; Rather than just plinking and plunking. The criteria that we use to evaluate sighting-in targets are: 1) size of target, 2) usability for different caliber firearms, 3) calibration lines on the target, and 4) number of shooting areas. The one target that we use to sight-in all our firearms is the Champion Traps & Targets Redfield Precision Sight-in Target. This 16" x 16" target is segmented into 1" squares (12 vertically and 12 horizontally), has a large center diamond target and 4 smaller corner diamond targets and is great for dialing in your sights. We normally perform our initial zeroing-in on the center target and then shoot at the smaller corner targets to make any fine sight adjustments. You can buy these targets at Amazon. ​Birchwood Casey Shoot-N-C 12" Sight-In Target - 12.25" x 12.25"
For sighting in at longer distances (e.g. 100+ yards) we find that you sometimes need a target that is easier to see the hits on. The criteria that we use to evaluate sighting-in targets are: 1) size of target, 2) usability for different caliber firearms, 3) calibration lines on the target, and 4) number of shooting areas. One of the targets that we use to sight-in firearms at 100+ yards is the Birchwood Casey Shoot-N-C 12" Sight-In Target. This 12 ¼” x 12 ¼” target is segmented into 1" squares (11 vertically and 12 horizontally), has a large center diamond target and 4 smaller corner diamond target and the bullet holes are shown by bright chartreuse rings when you hit the target – which we find very helpful when trying to identify the hits from 100+ yards away. We normally perform our initial zeroing-in on the center target and then shoot at the smaller corner targets to make any fine sight adjustments. You can buy these targets at Amazon. For sighting in firearms with scopes at 100+ yards we have found that having targets that align with the scope’s reticle are also helpful. The criteria that we use to evaluate sighting-in targets are: 1) size of target, 2) usability for different caliber firearms, 3) calibration lines on the target, and 4) number of shooting areas. One of the targets that we use to sight-in firearms with scopes at 100+ yards is the Birchwood Casey Shoot-N-C 12" Round X Target. This 12 ¼” x 12 ¼” target has a 11 ¾” ring, four bright orange crosshair lines at the 3, 6, 9 and 12 o’clock positions, an inner ring at 6”, a center target of 3”, a 1” square bull’s-eye and the bullet holes are shown by bright chartreuse rings when you hit the target – which we find very helpful when trying to identify the hits from 100+ yards away. You can buy these targets at Amazon. 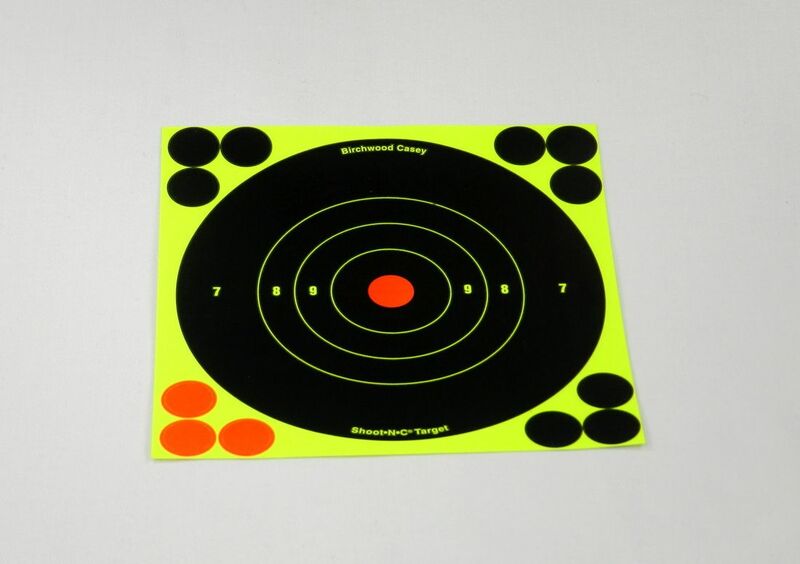 Birchwood Casey Shoot-N-C 6" Bull's-eye Target - 6.25" x 6.25"
Once our small caliber firearms (e.g. .22s) are sighted-in the first target that we normally shoot at is a medium accuracy target. The criteria that we use to evaluate medium accuracy targets are: 1) size of shooting area, 2) ability to see the impact hole and 3) price. Since .22 caliber rounds leave small holes that can be hard to see (especially at 25 and 60 yards) we like to use the Birchwood Casey Shoot-N-C 6" Bull's-eye Target 6.25" x 6.25" targets for this. The 6” target ring is plenty large to shoot at, even at distance, and the bullet holes are shown by bright chartreuse rings when you hit the target. Although each target comes with 12 “pasters” (9 black and 3 red) in the corner of the target to repair the target so that you can reuse it, we find that more often than not we use these pasters as small targets to shoot at to really test our skills. You can buy these targets at Amazon. 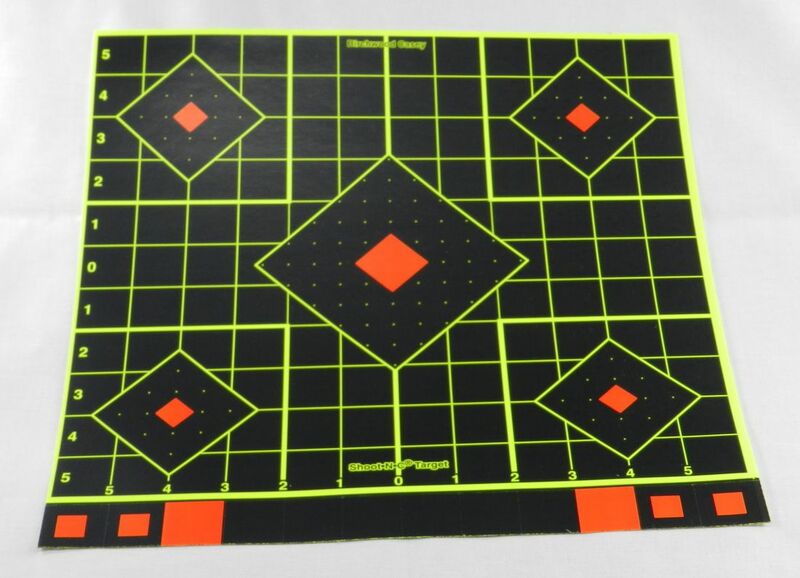 Birchwood Casey Shoot-N-C 3" Bull's-eye Target - 6.25" x 6.25"
After honing our skills on the 6” bull’s-eye targets we move on to higher accuracy targets with 3” bull’s-eyes. The criteria that we use to evaluate high accuracy targets are: 1) size of shooting area, 2) ability to see the impact hole, 3) number of bull’s-eyes per target and 4) price. For this application we like the Birchwood Casey Shoot-N-C 3" Bull's-eye Target - 6.25" x 6.25" targets. The overall size of the target sheet is the same as the medium accuracy targets (6.25" x 6.25") but instead of one 6" target there are four 3" targets with 10 black "pasters" per target. As before, the bullet holes are shown by bright chartreuse rings when you hit the target. You can buy these targets at Amazon. NRA Official 75 foot Small Bore Rifle Target - 10.5" x 12"
The final step in our small caliber shooting is shooting competition targets. The criteria that we use to evaluate competition accuracy targets are: 1) size of shooting area, 2) ability to see the impact hole, 3) number of bull’s-eyes per target and 4) price. To really test our skills we use the NRA Official 75 foot Small Bore Rifle Target - 10.5" x 12" targets. There are five 2 3/8" black bull’s-eyes on a sheet – and at distances beyond the 75 feet (25 yards) that the target was designed for it can be challenging to hit their centers. Although these targets do not have bright chartreuse rings we find that the solid black bulls-eye’s make it possible to see the hits – using binoculars at 25 yards and up. You can buy these targets at nationaltarget.com and sometimes Amazon. Birchwood Casey Eze-Scorer 12" Bull's-eye - 12.25" x 12.25"
For our larger caliber firearms (e.g. 9mm, 5.56mm and .223 caliber) we use a structure similar to the one we use for our .22 caliber firearms. We initially shoot at medium accuracy targets. The criteria that we use to evaluate medium accuracy targets are: 1) size of shooting area, 2) ability to see the impact hole and 3) price. Since the larger caliber rounds make larger holes in the targets we normally don’t use the “Shoot-N-C” targets with their bright chartreuse rings. For medium accuracy targets we use Birchwood Casey Eze-Scorer 12" Bull's-eye - targets. At 12.25” in size they are easy to see at distance (10 to 15 yards for handguns; 25, 60 and 100 yards for rifles) and the 12” bull’s-eyes provide plenty of room to hit once the firearms have been sighted-in. 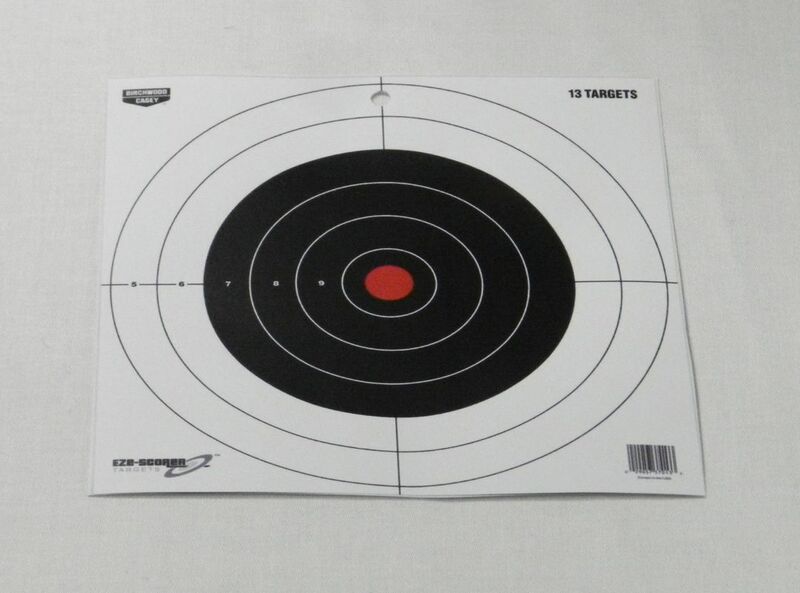 As a bonus a 13-sheet pack of these targets also includes a sheet of four of the 3" Shoot-N-C targets that we use for our .22s. You can buy these targets at Amazon. When shooting at 100+ yards we have found that you sometimes need a target that is easier to see the hits on. The criteria that we use to evaluate medium accuracy targets are: 1) size of shooting area, 2) ability to see the impact hole and 3) price. So, when shooting at 100+ yards we sometimes use the Birchwood Casey Shoot-N-C 12-Inch Bull's-Eye Target. This 12 ¼” x 12 ¼” target has an 11 ¾” ring, an inner ring at 7”, another ring at 3”, a 1” bull’s-eye circle and the bullet holes are shown by bright chartreuse rings when you hit the target – which we find very helpful when trying to identify the hits from 100+ yards away. You can buy these targets at Amazon. 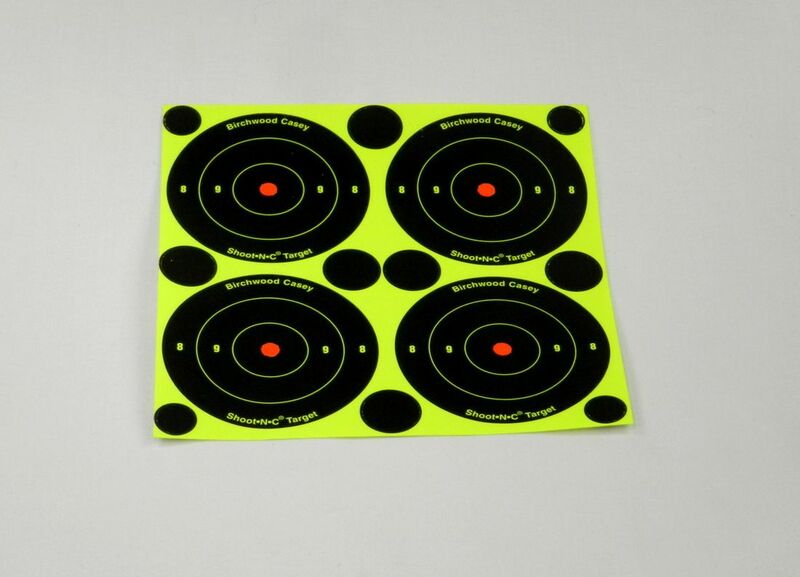 GlowShot 16" x 10" Reactive Splatter Targets - 17" x 10"
When shooting at 100+ yards we have found that we often have more variation in the vertical direction than in the horizontal direction. Because of this we searched for targets that were visible at a distance and had more height than width. The criteria that we use to evaluate medium accuracy targets are: 1) size of shooting area, 2) ability to see the impact hole and 3) price. 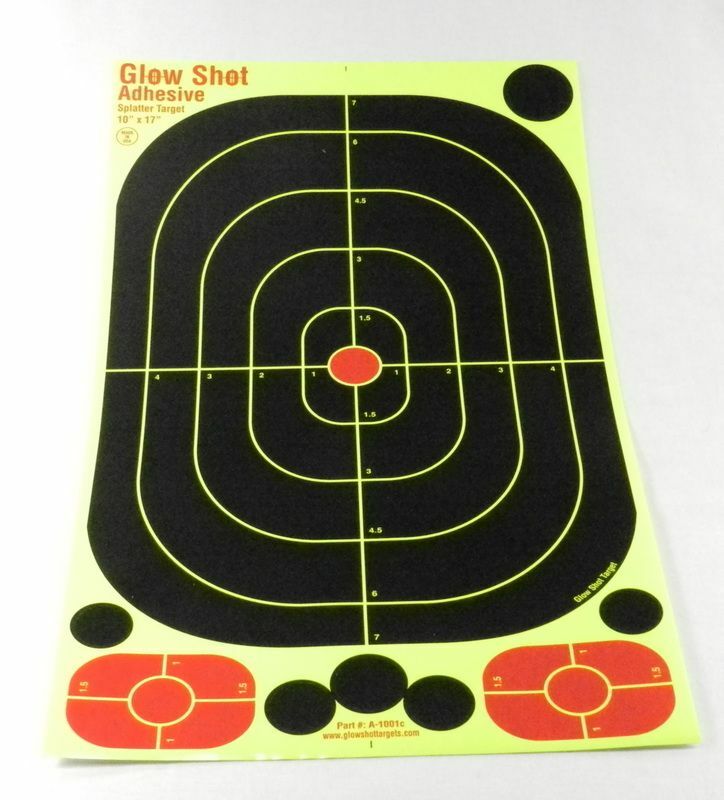 To meet this need we purchased GlowShot 16" x 10" Reactive Splatter Targets. This 17" x 10" target has a 14" x 9 ½" oval ring with 1" circular bulls-eye, and other concentric rings that are 1" wide and 1 ½" tall. The targets are made of thick, high quality paper and the bullet holes are shown by bright chartreuse rings when you hit the target. You can buy these targets at Amazon. Birchwood Casey Eze-Scorer 8" Bull's-eye - 8.5" x 8.5"
To really test our large caliber shooting abilities at distance we use high accuracy targets. The criteria that we use to evaluate high accuracy targets are: 1) size of shooting area, 2) ability to see the impact hole and 3) price. 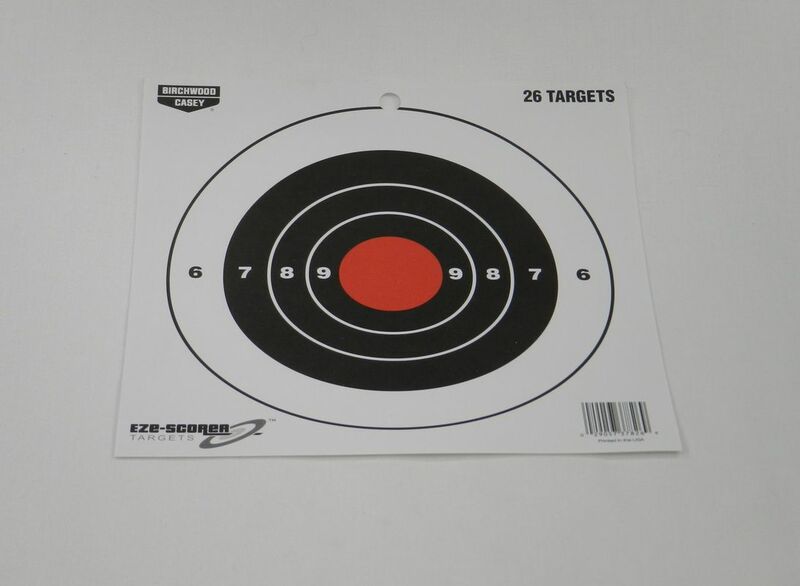 Similar to the medium accuracy targets, the Birchwood Casey Eze-Scorer 8" Bull's-eye targets have one target per sheet – but in this case it is an 8” target; which can be much harder to hit at distance with iron sights. 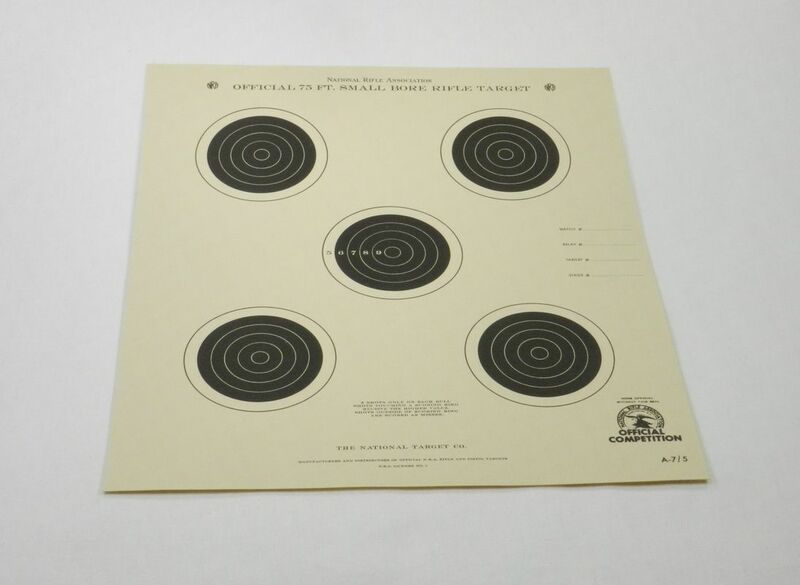 As a bonus a 26-sheet pack of these targets also includes a sheet of four of the 3" Shoot-N-C targets that we use for our .22s. You can buy these targets at Amazon. Champion Traps & Targets LE B27CB Green Silhouette Targets - 24" x 45"
For our shotgun we use a totally different type of target; a silhouette target. 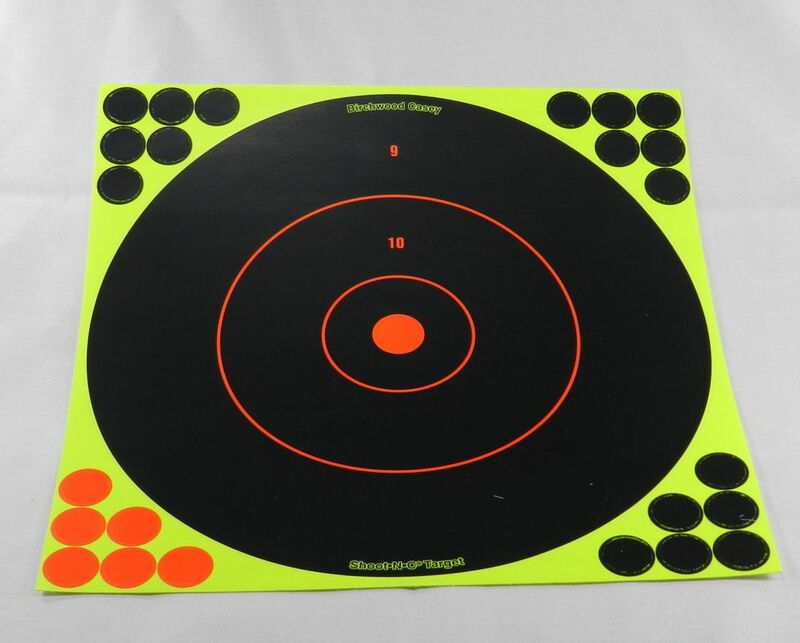 The criteria that we use to evaluate silhouette targets are: 1) size of shooting area and 2) price. 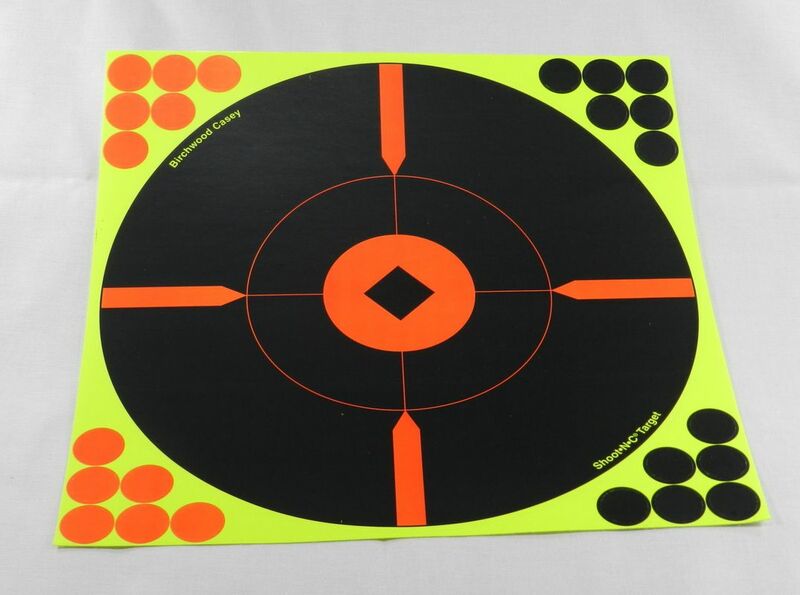 For working on our shotgun skills we use the Champion Traps & Targets LE B27CB Green Silhouette Targets. 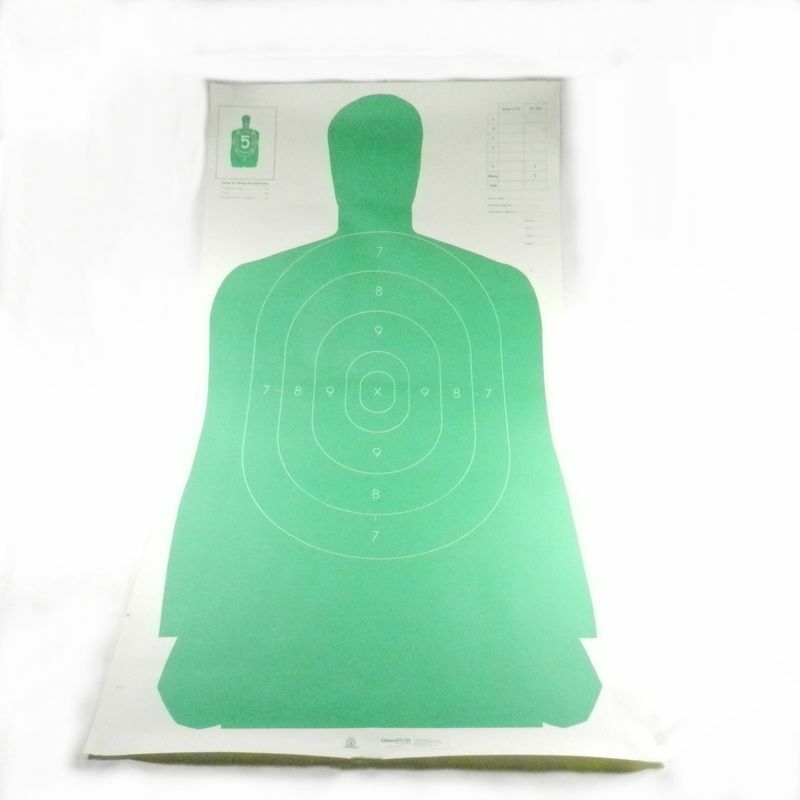 These targets are 24” wide and 45” tall and their high contract green on white design offers a very clear target to shoot at – even in low light. You can buy these targets at Amazon. Out of all our Hiking, Camping and Shooting gear the one item that we could never find an acceptable product on the market for was a bag for carrying our targets to the range. 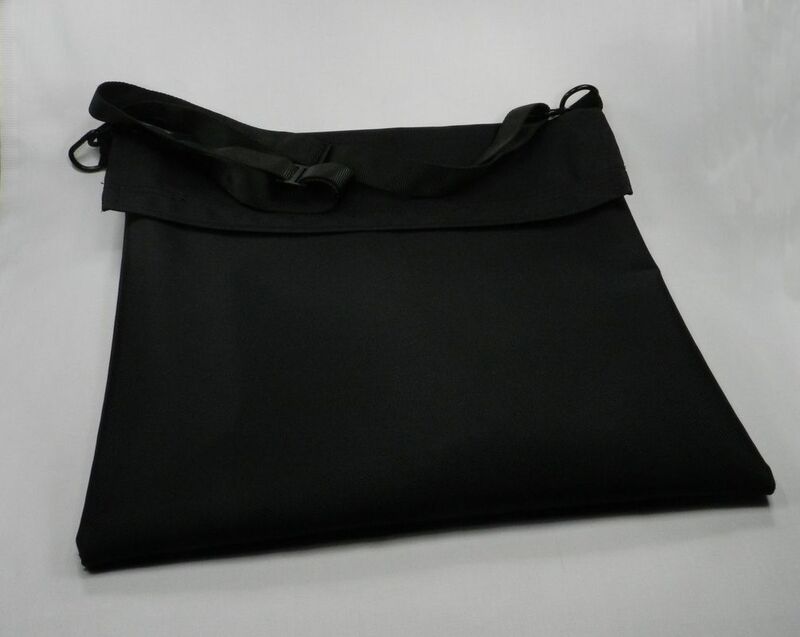 The criteria that we use to evaluate target bags are: 1) size – enough to hold our 16” x 16” targets, 2) flat shape, 3) shoulder strap, 4) velcro closure for easy opening and 5) price. We searched all sorts of categories in stores and on the internet. We looked at artist portfolio bags, messenger bags, computer bags, travel bags and every other bag under the sun. But we never found a 17” x 17” square bag; lots of rectangular bags – but no square bags. So ultimately I bought black ballistic 1050D water repellant coated nylon cordura fabric and an HK hook-type shoulder strap (Fire Force 2 Point 1¼" Sling) and had my wife make one. Unfortunately you cannot buy this bag since it was custom made. If you find a good bag for carrying your targets to the range please let me know.